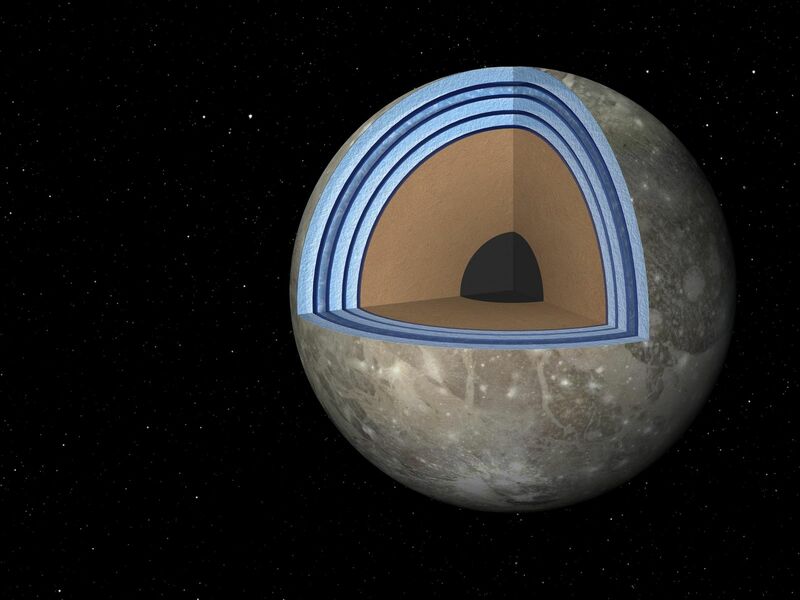 This artist's concept of Jupiter's moon Ganymede, the largest moon in the solar system, illustrates the "club sandwich" model of its interior oceans. 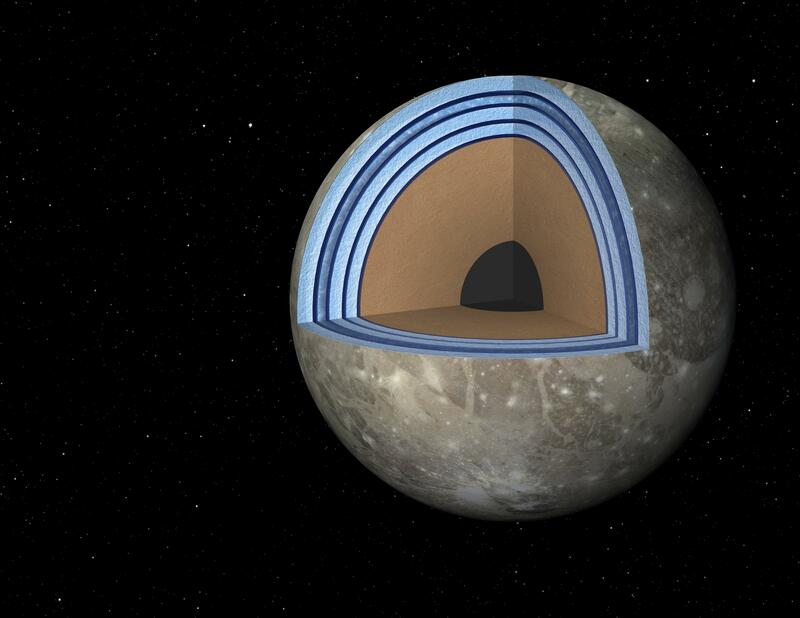 Scientists suspect Ganymede has a massive ocean under an icy crust. 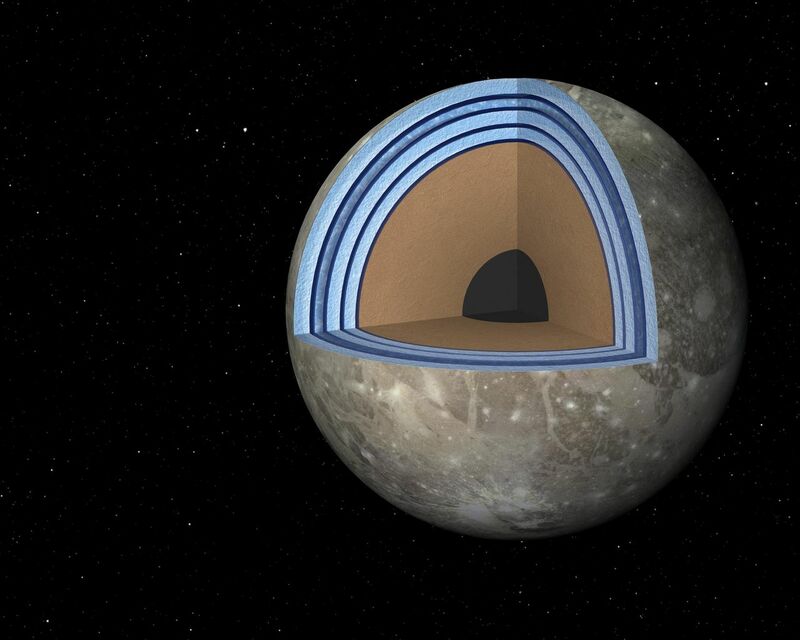 In fact, Ganymede's oceans may have 25 times the volume of those on Earth. Previous models of the moon showed the moon's ocean sandwiched between a top and bottom later of ice. A new model, based on experiments in the laboratory that simulate salty seas, shows that the ocean and ice may be stacked up in multiple layers, more like a club sandwich. Ice comes in different forms depending on pressures. "Ice I," the least dense form of ice, is what floats in your chilled beverages. As pressures increase, ice molecules become more tightly packed and thus more dense. Because Ganymede's oceans are up to 500 miles (800 kilometers) deep, they would experience more pressure than Earth's oceans. 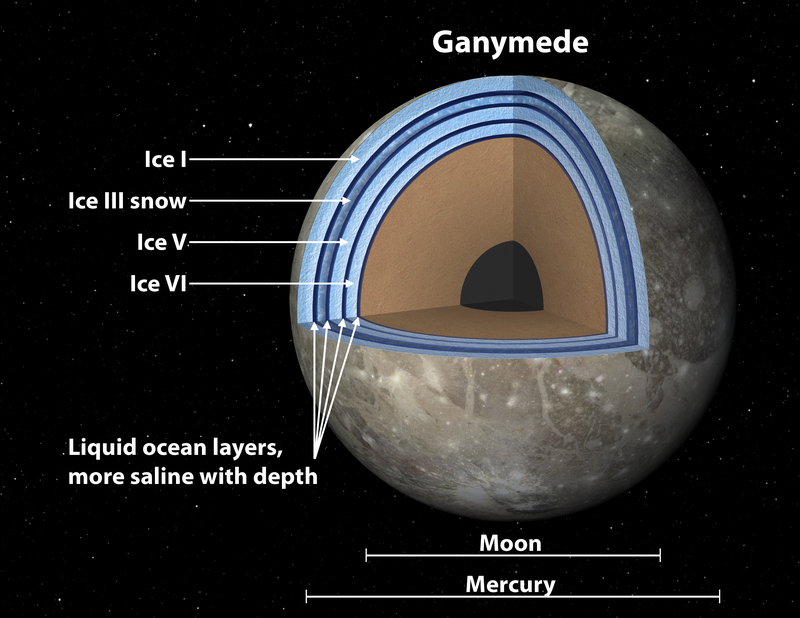 The deepest and most dense form of ice thought to exist on Ganymede is called "Ice VI." When researchers added in salt into their models of the ocean, they found the situation changed from what was previously thought. 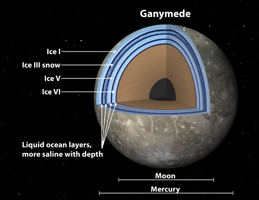 With enough salt, liquid in Ganymede can become dense enough to sink to the very bottom of the seafloor, below Ice VI. Their models also suggest a complex stacking of ocean and ice, as illustrated in the picture. What's more, the model shows that a strange phenomenon might occur in the uppermost liquid layer, where ice floats upward. In this scenario, cold plumes cause Ice III to form. As the ice forms, salt precipitates out. The salt then sinks down while the ice "snows" upward. 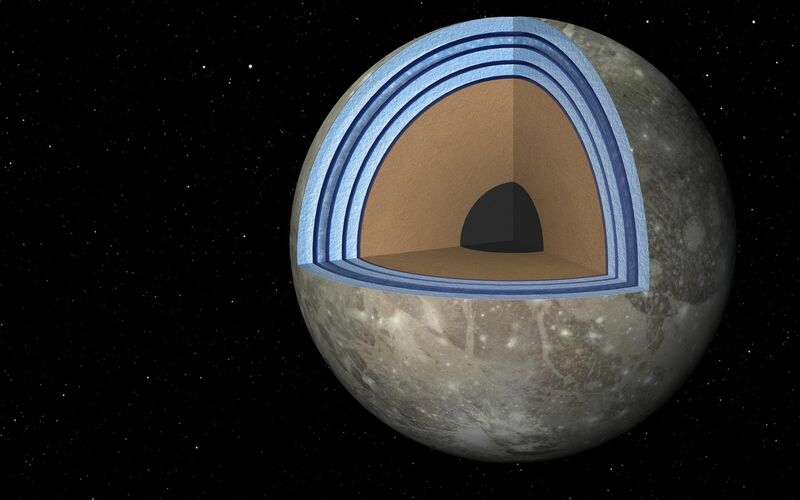 Eventually, this ice would melt, resulting in a slushy layer in Ganymede's club sandwich structure. Scientists say this structure may not be stable. It's possible the moon goes through a club sandwich phase, while at other times goes back to being more like a regular sandwich, with one ocean sitting below the familiar Ice I found on Earth and on top of different high-pressure ices. The fact that salty water may persist at the bottom of the rocky seafloor, rather than ice, is favorable for the development of life. Researchers think life emerges through a series of chemical interactions at water-mineral interfaces, so a wet seafloor on Ganymede might be a key ingredient for life there.